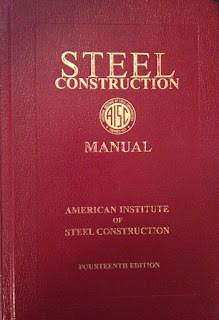 This Manual is the 14th major update of the AISC Steel Construction Manual, which was first published in 1927. The 14th edition, released in 2011, contains several updates and revisions from the 13th edtion, including the new HP18 and HP16 series, updated connection tables based on increased bolt shear strength values, revised single-plate and extended single-plate connection design procedures, enhanced prying action procedure, and a revised bracket plate design procedure. The most current printing of this publication is the fourth printing. Section 1.1 Introduction Last Revised: 11/04/2014 Structural steel is one of the basic materials used by structural engineers. Steel, as a structural material has exceptional strength, stiffness, and ductility properties. As a result of these properties, steel is readily produced in a extensive variety of structural shapes to satisfy a wide range of application needs. The wide spread use of structural steel makes it necessary for structural engineers to be well versed in its properties and uses. The structural steel industry in the United States is represented principally by the American Society of Steel Construction (AISC). AISC works tirelessly to advance the science and art associated with producing, designing, fabricating, and erecting structural steel. One of their many available resources is the AISC Steel Construction Manual (SCM). This course focuses on training the engineering student to apply the basic design specifications contained in the SCM. In addition, the student will become familiar with many of the design aids contained in the SCM. In order for a student to progress through the material presented in this course, it is essential that they are well versed in engineering statics, mechanics, properties of materials, and structural analysis.